Hotel Lombardy, Washington, United States of America - Lowest Rate Guaranteed! With a stay at Hotel Lombardy in Washington (Foggy Bottom), you'll be a 5-minute walk from George Washington University and 15 minutes by foot from White House. 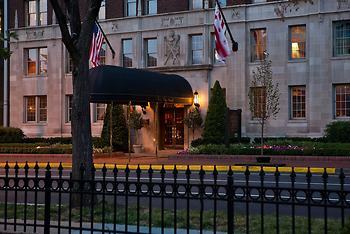 This romantic hotel is 0.3 mi (0.5 km) from George Washington University Hospital and 0.7 mi (1.1 km) from Dupont Circle. Staff was outstanding.....front desk and bellmen in particular. I liked the location of the hotel. The staff was friendly and helpful we had a nice experience at the lounge! David, the bartender, was friendly and made excellent drinks. It’s great to have a place we can come and stay when we visit our son at GW the next 4 years— it feels like home. Pillows are very bad. The noise outside woke us many times in the night— not sure there is much you can do! Staff was excellent - very friendly! The new door lock system is a real problem. More than once I needed assistance, because the door was so har to open. And it was not just me - other guests confirmed the problem. I overheard a hotel guest who told the reception desk personnel that there was mouse poison laid out in her room. I do not know whether that is true, but if it is, then those rooms should not be available to guests. I love this place. So conveniently located close to George Washington University and so many museums and tourist sites. The staff is great. My only complaint is no iron or ironing board in the room. And would be nice to have a full length mirror in the room. The cheerful, pleasant, kind, professional, impeccably dressed desk staff really set the tone for the stay. Of course,the doorman/valet contributed.